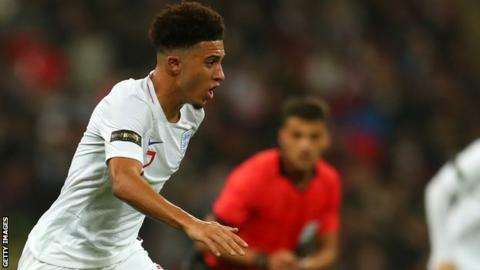 Manchester City made a banned payment of £200,000 to Jadon Sancho's agent when the England winger was 14 years old, according to Der Spiegel. The German magazine claims City made the payment to Emeka Obasi when they signed Sancho, now at Borussia Dortmund, from Watford in March 2015. Football Association rules say young players cannot be represented by an agent until the year they turn 16. "The attempt to damage our reputation is organised and clear," City said. "We will not be providing any comment on out-of-context materials purported to have been hacked or stolen from City Football Group and Manchester City personnel and associated people." How damaging are the Football Leaks allegations about Man City? Man City and Paris St-Germain are "cheating and should be punished"
London-born Sancho, 18, joined City as a 14-year-old, when the Premier League champions paid £66,000 in compensation to Watford. Rules also state clubs are not permitted to offer financial inducements to a player under 16. Der Spiegel - which has published a series of revelations in recent months, including allegations City deceived Uefa over financial fair play (FFP) rules - claims the club wrote a letter to Sancho's father which outlined how much they were willing to pay the player once he turned professional. The magazine also says a City lawyer was "alarmed" the letter could be deemed as a financial offer and therefore breaking the rules about offering inducements. Der Spiegel alleges City paid £200,000 to Obasi as part of a scouting contract to find players in central and South America. It claims the payment was in fact in relation to Sancho's transfer from Watford. Sancho never made a first-team appearance for City before moving to German giants Dortmund for £8m in August 2017. He has been one of the star players for the Bundesliga leaders this season, with the club describing him as "one of the most exciting players in Europe" when they announced he had signed a new long-term contract in October. In April 2017, Liverpool were fined £100,000 by the Premier League and handed a two-year ban on signing academy players from other clubs for offering inducements to a 12-year-old academy player at Stoke City. BBC Sport has contacted Sancho's representatives for comment.